Well Folks, I'm taking a break. Got through the Morning Routine early after getting up at 5AM and taking Mrs Dog for a drag up and down Wilton Drive. So now, I'm sitting in the chair thinking of what's going to happen today. There's a big ball of Bread Dough rattling around in the Bread Machine waiting to be taken out to rise and make Rolls for dinner. Take this recipe from my Sister Pat, and divide into 10 parts for some of the most amazing 150 calorie rolls you've ever had. Cookies will be made today after the bread is baked. It's going to be a busy afternoon. 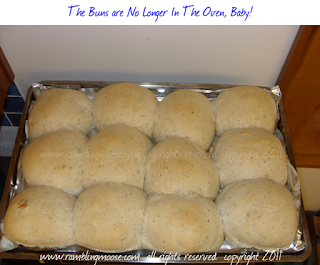 I have never actually posted that particular recipe, but I have written about it. Chocolate Chip Pecan cookies. They're a winner and you'll have to take my word for it. Of course there's the last minute cleaning and vacuuming that has to happen as well. Having spent the weekend making Tomato Pie Sauce that works amazingly well as a spaghetti sauce doesn't leave the house clean. That's another one I haven't written about, although it was from another web site that I've lost the link for. I'll have to add a reminder for that one, it's really quite good and completely from scratch. Oh, and it's not only vegetarian, but vegan, so if you aren't into that, toss in something to beef it up. We don't and it isn't necessary. Lisa and Billy will be coming over from across the street for dinner. Billy's bringing some Kebabs to make on our grill and we'll be enjoying their company tonight for dinner and chat. So whatever you do and whoever you it with, enjoy your day. I know I will. Now, if you will excuse me, I've got a bread machine beeping at me. The first batch of dough is ready to come out of the machine to be made into rolls to rise for a couple hours.